Copyright 2004, 2014 Mark Dahmke, All Rights Reserved. In high school, I’d read about an amazing new device that could electronically synthesize the sounds of the human voice. The machine was clunky and expensive, and more geared toward research than any practical application. After reading about it, I gave some thought to how one would design a synthesizer, but the technology was way beyond my level of understanding, so I moved on to other projects. While a college student, I worked part-time at the University Computing Network. One day in early September, 1978, I happened to walk by my manager’s office just as he was talking with another staff member about someone’s personal computer. I stuck my head in the open door and said, “Did I hear you say something about a microcomputer?” My manager, Ken Livingston said that Dr. Lois Schwab, Director of the Independent Living Center, wanted to talk with someone about a grant proposal for a project involving a Radio Shack computer. This random encounter changed the direction of my life. After the initial grant business, we found ourselves talking about computers, prosthetics and voice synthesizers. I mentioned that in high school I’d looked into building a speech synthesizer as a science fair project, and Dr. Schwab suggested that we look into the possibility of a pilot project. We both said “How about Bill Rush,” at the same time. At that time I hadn’t met Bill, but I knew of him, since we both lived in Selleck Hall. Within hours of this meeting, Dr. Schwab contacted the University Affirmative Action office and other agencies, and obtained a commitment of support. Part of the funding came from the Nebraska Division of Rehabilitation Services, United Cerebral Palsy and the rest from the University Affirmative Action office. Then I decided to tell him the big news. Things happened quickly after that first meeting. Suddenly, someone was funding a project that I’d dreamed of since 1973. I now had a microcomputer system that I could use to develop the synthesizer, and someone else was paying for the voice synthesizer hardware. I’d seen ads for a commercial synthesizer from a company called Computalker Consultants, so I decided to use their hardware, since it was compatible with my S-100 based Z80 computer. I estimated the total cost for hardware and development at $3,000. I built what I called a “vocabulary management system” that kept key words and phrases in main memory for speed, and loaded vocabularies from a floppy disk. Since memory was limited, Bill would have to choose the vocabulary he needed at the time. For example, he could have a vocabulary for conversation and phone calls, and another tailored to his journalism classes and other activities. The Computalker came with software tools and utilities that a software developer could integrate into their applications. In addition to the phonetic mode, it had a text-to-speech mode and a mode that used hand-optimized phonemes to produce very accurate pronunciations. The problem was that you couldn’t use all of the modes simultaneously. The phonetic mode required laboriously crafting each word as a sequence of characters. “Hello” became HHIX3LOW1. These phonemes told the software exactly how to pronounce each letter or sound, and where to place the stress. The spelling mode used the highly optimized stored phonemes which were more easily understood over the telephone, but they couldn’t be combined into words. They allowed Bill to use the phone without assistance for the first time in his life, but required the person on the other end to keep track of what he was spelling and put the words together—not an easy task. The phonetic mode produced adequate speech, but was hard to understand over the phone. The software I developed allowed Bill to create words phonetically and add them to the dictionary, and then combine them into phrases and sentences that were also stored in the dictionary. As he typed each letter, the system would search the dictionary to find the word that most closely matched what he was typing, similar to the way modern word processors attempt to predict words as you type. When the software was ready, we needed a computer to run it. I knew a guy from the Computing Network office who had a used Poly-88 Z80 computer that he wanted to sell, so we arranged to buy it from him, along with a North Star 5.25” floppy disk controller and drive. A 32K memory card and the Computalker completed the system, which was dubbed “The Bionic Voice.” Another friend who I met through the local Altair Computer Store had designed a keyboard circuit board that he was trying to sell, so we bought one and modified it to handle additional key codes. My idea was to add a bank of 48 keys with specific words and phrases assigned to them, to make it easier for Bill to speak quickly. I found a company that would engrave custom labels on blank key tops. Bill gave me a list of commonly used words such as: Yes, No, Oops, Hello, I, I’m, How, and Please. In the fall of 1979 Lois Schwab met Anne Fadiman, a writer for Life Magazine, at a conference in Chicago. Anne was working on a story about disabilities and technology and expressed interest in our project. She and later came to Lincoln to write a story about Bill. It appeared in the January 1980 issue of Life. Bill used this system until we got funding from Vocational Rehabilitation for an upgrade, which I built in 1980. We added several improvements, such as a second floppy drive, a word processor, and a single line LCD display in the keyboard. Bill found it difficult to type and look at the screen simultaneously, so the addition of a single line display just above the top row of keys allowed him to see what he was typing. I installed a Microangelo video display board and modified a word processor called “Wordsmith” to work with the single line display and his custom keyboard. By this time the computer ran on the CP/M operating system instead of NorthStar DOS. Later, we added a contraption that used solenoids to press keys on Bill’s old IBM Selectric, in hopes that he could use it as a printer, but it didn’t work very well. In 1980 he got a Diablo printer that I interfaced to his computer. In 1983, it was clear that the IBM personal computer was going to become a standard, and that it was time to upgrade. We decided on a Compaq portable, the original “sewing machine” transportable that was introduced in 1983. We abandoned the old Computalker and my dictionary software in favor of a speech synthesizer product built by my friend Steve Ciarcia who owned a business called Micromint, and who also wrote a popular column for Byte Magazine. The new software was written in Compiled Basic and was similar to the old dictionary manager, but took advantage of the better phonetic and text-to-speech capabilities of Steve’s design. The real challenges came when Bill moved into his first apartment. The phone company provided him with a prototype device called an Abilityphone. The Abilityphone really made it possible for Bill to live independently. 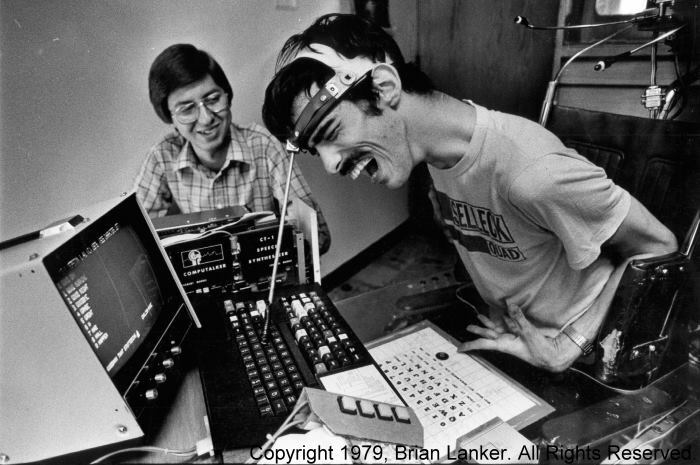 It gave him access to basic telephone functions through a switch mounted on his wheelchair. It cycled through menus and allowed him to pick a menu option by pressing a switch. It also controlled X10 power line modules so he could turn lights and appliances on and off. 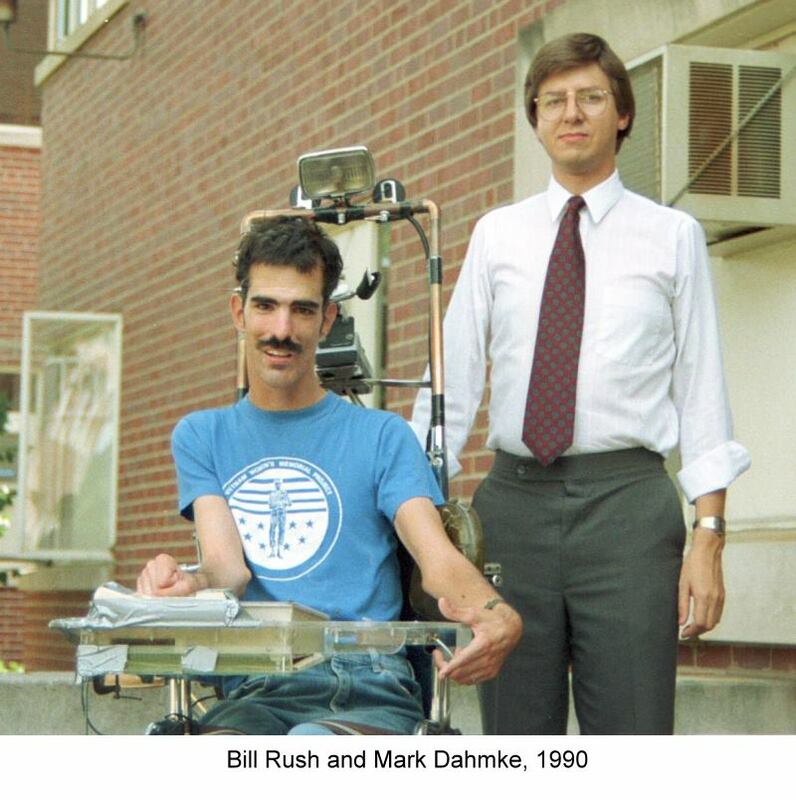 In the late 80s, Prentke Romich introduced a portable speech synthesizer that could be mounted on the tray of Bill’s wheelchair. At first Bill was reluctant to switch, out of personal loyalty, but I urged him to go for the best available technology. I told him that it was a better, more portable system, and that he should do what’s best for him. He continued to use the PC-based voice as a backup, but eventually switched over to the Minspeak-based system. When Bill switched to the Compaq computer in 1983, we added a CD-ROM drive so he could have access to Microsoft’s Thesaurus, dictionary and encyclopedia. This greatly expanded his ability to do research at home. He started to buy other CD-based reference materials and then we started to have problems. The CDs in those days had to be inserted into a caddy, which meant buying lots of caddies. Bill couldn’t insert or remove them, so he had to wait for a personal care attendant to come to do it for him. When he upgraded to a faster desktop computer, we added a five disc CD changer. This was an improvement, but the access speed was actually slower, waiting for the discs to load. In 1988 Bill Rush went to a conference in California and met Chris Robinson. Chris was a vocational rehab specialist from Toronto, and from the way they describe it, it was love at first sight. Chris moved to Lincoln a few years later, and they got married in 1999. It took the better part of ten years to get everyone (their parents, and the State of Nebraska) to go along with the idea of marriage. Bill would no longer be eligible for support (such as attendant care services) and that would place an impossible burden on Chris. Finally they were able to use a law passed to assist older couples if one partner became disabled. Anne Fadiman flew in from New York for the wedding and Bill asked me to be Best Man. Twenty years earlier (almost to the day) Anne had come to Lincoln to write the article that appeared in Life magazine. In 1998, a year before Bill and Chris were married, they built a house. Chris moved in first, and Bill continued to live in his apartment until after their wedding. I assisted by reviewing the floor plans and made some suggestions, including adding a cinder block “tornado room” since the home was built on a slab and had no basement. It’s one of the features I wish I’d added when I built my own house. The utility room was built entirely out of concrete block with rebar reinforcements. The builder came up with a creative solution for the doors. Bill needed to be able to enter and leave the room even during a power failure. The door from the bathroom into the utility room could be pushed open by Bill in his wheelchair, and would automatically swing shut and latch after he cleared the door. The door from the utility room into the kitchen also would automatically close and latch, but was hung so that it could be pushed open from inside the utility room. This way Bill could enter and leave, but had to use two separate doors that, for him or someone in a wheelchair, were effectively one-way doors. When Bill moved in, I reinstalled the old home control system (nicknamed Henry, because the voice sounded somewhat like Henry Kissinger). We added small TV monitors so Bill could see who was at the front door, and configured it to be able to open either the front or side doors. My plan was to replace the entire aging system with a new Linux-based home control system but Bill’s neck surgery and recuperation derailed those plans. During the last few months of his life, Bill was once again entirely dependent on his personal care attendants and Chris. The last thing I did for him was help hook up a switch with a beeper so he could call for help at night. In the 26 years I’d known Bill, I’d never been so frustrated that I could not do anything more to help. There was just nothing else I could do to empower him, and it was the first time in decades that he’d had to rely on others for absolutely everything. It was a return to his childhood and I can’t begin to imagine how dependent he must have felt. During his hospital stay, his only means of communication was through Chris, so she virtually lived at the hospital for six months. Without Chris, he would not have survived. Their level of nonverbal communication was astonishing, and made it possible for Bill to communicate his needs through his eyes and facial expressions. Perhaps the day will come when communication aids will be implanted, spinal cords can be repaired, vision can be replaced, and augmented brains and bodies will virtually eliminate physical disabilities. These new technologies are developing rapidly and some predict that by the middle of the twenty first century we will all be “enhanced” in one way or another. If these technologies reach the same levels of mass production as microprocessors and memory chips, they will become commodity items in another 30 to 40 years, and there will be no price barriers that would restrict them to the ultra-rich. Bill lived in a period where medical technology was advanced enough to save his life at birth, yet not advanced enough to repair or enhance his body to the point where he could live independently without an extensive support system. The Bionic Voice, and later the Abilityphone and Touchtalker were very primitive steps in the direction of self-sufficiency and independent living. Bill’s real support system included not only a lot of computer technology, but many good people who gave of themselves to help him live a happy and productive life. All of us have a support system that includes technology and our friends and family. Life would simply be impossible without it, yet we take it for granted. Bill just required a more extensive support system than most of us, yet it was not really any different in kind. Bill Rush’s health began to deteriorate about a year after he and Chris were married. The doctors kept telling him that the tingling he felt in his extremities was just a symptom of aging and cerebral palsy, but there was much more to it than that. In the 90s, he’d had several accidents that damaged his spinal cord. This, combined with a lifetime of stress on his neck caused by using a headstick to communicate had taken its toll. It was Chris who kept telling the doctors that their diagnosis was incorrect, and finally they listened. Bill had emergency surgery to relieve the pressure on his spinal cord. Had he not had the surgery he might have lost all sensation below his neck, or he might have died. The recovery process took several years as his mind and body rewired his spinal cord and learned new pathways. Over a period of years he was on an incredible amount of pain medication, but he continued to write at a prodigious rate. He was working on a second book, in addition to his regular articles in the League of Human Dignity’s newsletter and other publications. In 2003, he was battling pneumonia in addition to the constant pain. He spent virtually all of 2004 in the intensive care unit at St. Elizabeth’s and had to be resuscitated once. Bill’s love for Chris, his will power and desire to finish his second book kept him going through unimaginable levels of pain. In October of 2004, he realized that he could not win the battle and decided that it was time to go home to die. Chris contacted all of his friends and told them that it was time to tell Bill what he meant to them, and the outpouring of email and letters was amazing and very moving. On November 13, 2004, exactly one month before Bill died, I went to see him. That evening I copied the manuscript for this second book to my USB flash drive in order to email it to Anne Fadiman. Just weeks earlier, he was up at his computer, organizing the final chapters and making changes to his manuscript, preparing it for Anne. We were all amazed at his ability to stay focused, given the amount of morphine he was getting for the pain. I told Bill that I’d recently reread his first book, Journey Out of Silence. I also mentioned the time when he correctly diagnosed the broken drive belt on the floppy disk drive of his first computer. I told him that I remembered how pleased and excited he was that he’d figured out what was wrong on his own. When I arrived to fix the computer, he was beaming. I added that Anne said she’d read the manuscript and that she thought it was very good–and she was impressed by how complete it was. I told him that we’d make sure it got published. I told him that as a journalist I knew he wouldn’t want to be the story, but that he was about to become the story. I said that he didn’t realize what he’d accomplished, and how many people it would affect—that he might not have wanted the story to end this way, but it would help a lot of people. We talked about Bill being stubborn and not wanting to let go, but that he needs to trust that we’ll get it published, and I told him it would be a great book. I said that the words that came to my mind were “I’ve done all I can do, I can do no more.” I told him he was a pioneer, and again said that his experience would help lots of people. Bill asked about my USB flash drive, and I explained how it worked and how much data it could hold, compared to a floppy disk or CD-ROM. After that, he went to sleep again. When he woke up a few minutes later, he asked how I’d send the manuscript to Anne, and I told him I’d email it that same evening, and that would be the easy part. Every time I saw Bill during those last two months, when I left I’d always say “Goodbye Bill,” not knowing if it would be the last time. I always said it as if I’d be seeing him again in a few days. A month later, on December 10th, my wife and I went to San Francisco to meet with a potential client, and we returned on Sunday the 12th. Chris left a message asking if we could come over right away when we got home. We went directly to their house from the airport. I don’t have any clear memories of that visit, except that Bill was concerned about getting his book published. He slept most of the time we were there. We’ve all experienced it: you meet someone and you instantly feel that you’ve known them for your entire life. That’s how it was when I met Bill. It seems to me that this feeling is the result of a high level of communication between people who think alike. Most people seemed to have difficulty communicating with Bill, but for me it just seemed completely natural and was not really an obstacle. A new friendship is somewhat like exploring new territory, but it’s an “idea space” rather than a physical space. It expands our boundaries and generates new ideas and new ways of thinking. I learned a lot from Bill—and I continue to learn. I know Bill didn’t like it when people talked about his superhuman courage and strength of will, but we all know what kind of stuff he was made of. The word “perseverance” doesn’t begin to cover it. I was just amazed at his ability to keep up with his college courses and homework. I never, ever, worked that hard in school. So what did I do but come into his life and give him even more to deal with, like learning how to operate a microcomputer at a time when he’d had bad experiences with the University’s IBM mainframe computer, and new speech synthesis software, at a time when software was very un-user-friendly, by modern standards. But I also had to improve my skills, because quite often the software features I thought would be useful turned out to be really bad ideas. So I had to watch and learn, and figure out how to make it easy for him to use. Acquaintances and friends come and go, but how many people can we count as true friends—who are always there for us, as fellow travelers on our journey through life? Most of us can count them on one hand (or maybe two if we’re really lucky). When we have tough decisions to make or just need another point of view, they’re always there, in person, or in spirit as the little voice in our head, the little voice that becomes a guide and moral compass. Over the years Bill has had many different voices, but the one I hear in my mind, and my dreams, is always crystal clear, and unequivocal. Bill’s intelligence, wit and strength of character will always be with me, and for that I am eternally grateful.